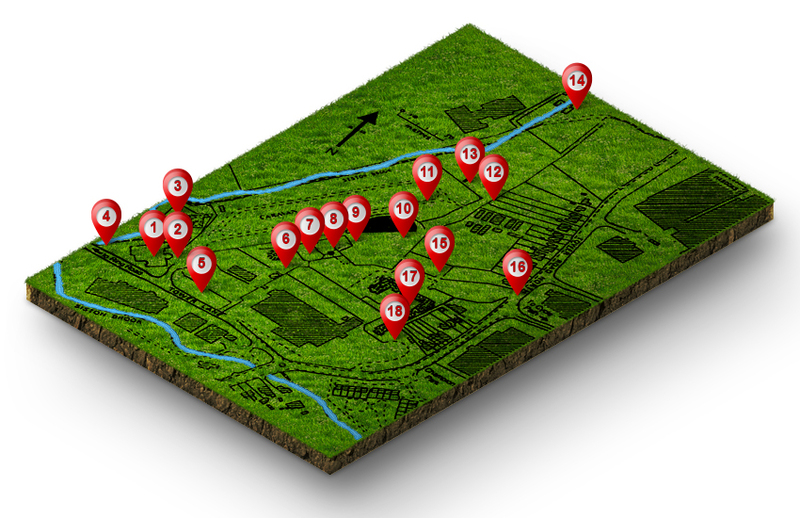 Take a look at the different points on the map to see their descriptions in order to find out about the many exciting things that Kingswood museum has to offer when you next visit us. We are sure you will find some great things of interest. William Champion’s Zinc and Brass Works was, in the 18th century, probably the largest industrial site in Europe. Interpretation of the site can be seen in a dedicated gallery. Here are models of a zinc foundry and workers’ housing alongside explanations of the zinc and brass making processes. William Champion invented and patented a method of producing zinc from calamine (zinc bearing ore). His methods enabled him to produce a much higher quality brass than his rivals. He prospered until his patent ran out, then his rivals started to use his processes and he went bankrupt. The tallest, oldest and most complete industrial ore-crushing windmill tower in the country, the machinery it drove was used to crush the ore before smelting, using a stamping system run from lay shafts. The archways through which the shafts ran – now bricked up – can still be seen. 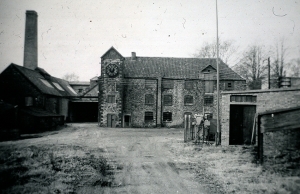 The original outer cap, and all the working machinery were removed many years ago. The floors and stairs inside are also gone, but visitors may still see the joist holes and note the thickness of the walls. 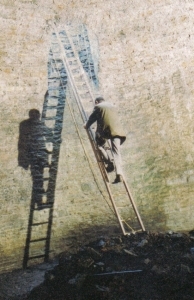 This enormous domed circular chamber, mostly underground, is known to have been used in the 19th century to store ice from the lake for use in the house. Some also went to the fish market in Bristol. The original purpose for this huge structure is uncertain but there is no reason to believe that Willam Champion did not also use it as an ice house. The vast size of the ice-house indicates that its origins were industrial or commercial. An estimated 250 tons of crushed ice could be stored in the chamber. The ice would be taken from the adjacent 13 acre lake during the winter months. Free car parking is available for you when you visit us at Kingswood museum. 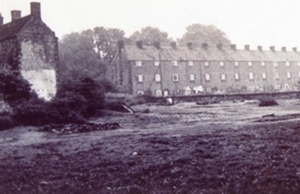 Like many philanthropic Quaker employers, William Champion constructed housing for some of his workers – possibly those whom he brought from overseas. 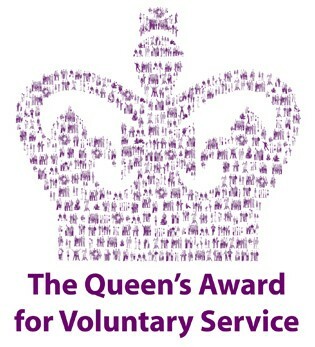 This rank is acknowledged as being amongst the earliest social housing in the country. Built on three floors, the houses were small but adequate, and local people still remember friends and relatives who lived there and took a pride in keeping them spick and span. The whole rank was demolished in 1966 but a detailed model is on show in the museum. 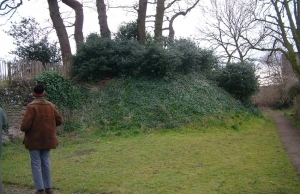 A mound was a fashionable feature of many 18th century gardens. It would have provided a viewing point over the estate and across to Tog Hill, Lansdown, Kelston and Dundry. Many such features had a small summer house at their peak, although excavations here have revealed no signs of any structure, merely establishing that the mound was not built from industrial waste but from natural material. Oak trees, probably planted in Victorian times, now crown the top, and holly bushes on the sides suggest the possible line of a spiral path. 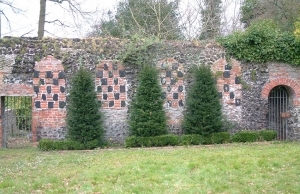 Two walled courtyard areas are linked by an archway through this wall, which takes its name from the attractive pattern of brick and black slag blocks. Within the walls there is archeaological evidence for a sheltered garden laid out with gravel paths and shrubs. 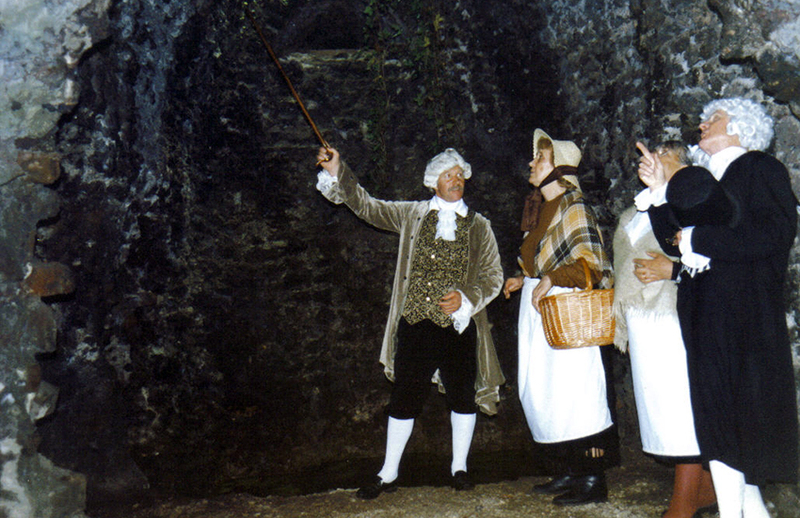 Fashionable 18th century gentlemen often had such features included in their gardens – sometimes with a resident hermit! They may have been meant to represent the descent into the underworld. There is certainly a grotesque face within this complex whose mouth forms an open archway. 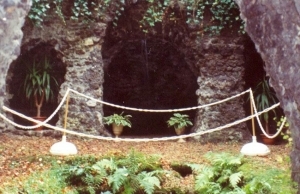 The mysterious collection of vaulted chambers at Warmley comprises one of the most extensive man-made grottoes in England. Constructed of mortar and clinker from the nearby works, these passages and cave-like structures include a complex water system that once produced cascades and pools. For safety reasons, there is no public access to this dank and gloomy warren except on Bank Holidays (see Forthcoming events for open dates). Then the gates are opened and the water flows once again, the tunnels are lit, and music and statues recreate in part the haven of tranquillity once enjoyed by William Champion, his family and friends. Despite its name, the original purpose of this building is uncertain, although there are subterranean archways into which boats could have been floated. There is also a small platform with steps to the gardens. At one time a floor was introduced halfway up, and windows added, forming a small apartment reached by a narrow staircase on the eastern side. This quite attractive structure with its slate roof was, however, reduced to a shell by a fire in 1968. 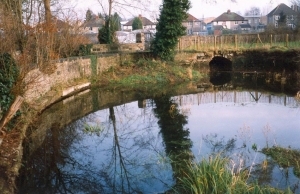 Mentioned in a written account of his visit to the Warmley gardens in 1767 by Sir Joseph Banks, the semi-circular pond was once fed by water from the leet which ran the whole length of the Champion estate and may have served as an overflow for the water system. 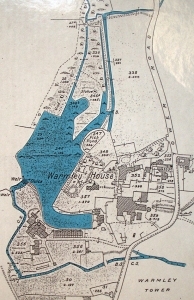 An additional purpose may have been as a fish pond for the house; it was certainly shown as such on later 19th century maps of the area. Despite several attempts to restore the pond it has become partly overgrown but the echo may still be heard from immediately in front of the pond facing the back wall. 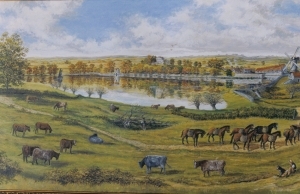 Most of what was once a five hectare (13 acre) lake, formed by the damming of Siston Brook, is now a mobile home park. 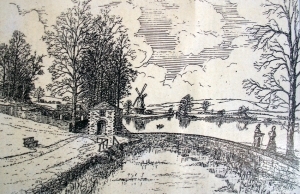 The lake would have been an important feature of William Champion’s brass and copper works, providing water to run a series of water wheels. It also, of course, provided a most pleasing aspect of the gardens, and Champion’s guests would no doubt have marvelled at the 9 metre (30 foot) high statue of Neptune which held court over the waters. Later occupants of Warmley House held skating parties in the winter. This pathway stretched almost a quarter of a mile from the lawns to the Summer House, following the course of the leet and originally upon a raised causeway between it and the lake. The elms, recorded by Canon Ellacombe in 1881, were struck down by Dutch Elm disease in the 1970s. Walks were an important part of garden design in the Dutch style and a smaller Laurel walk was noted in the 19th century between the boat house and the mound. Known locally as the ‘Warmley giant’, this representation of the king of the sea was once surrounded by the lake which formed when William Champion dammed Siston Brook. 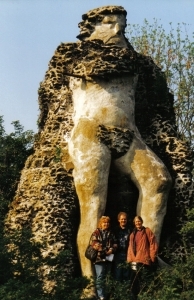 It was quite common in the 18th century for landowners to have statues placed in their private gardens; what is unusual about this one is not only its size – around nine metres (30 feet) high – but also its composition. It is made almost entirely of cement and decorated with black clinker from Champion’s works. Over the years Neptune became hidden by ivy, and some people did not even know what lay behind the high tower of greenery. Attempts have been made in the 1970s and 1980s to uncover the statue – with varying success. It is now possible to see the figure but, sadly, both the arms are gone, as is the trident and any crown he may have worn. Descriptions vary as to the position of the arms. Canon Ellacombe in his “History of Kingswood” (1891) said that: ” …one arm extended held the usual barbed fork”. 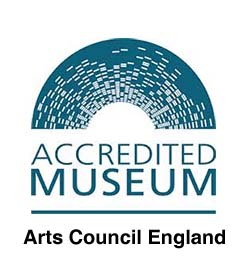 However, a local inhabitant who remembers playing in the garden as a child has told the Musuem Trust that his left arm lay across his body to hold the top of the trident whilst the other hung down to hold the bottom. This would seem to be substantiated by the fact that metal supports can be seen across the chest which most likely helped to hold the arm in place. The lost trident is said to have hung in the stable of Warmley House for many years but vanished some time ago. If someone knows where it is, they certainly are not saying . . . 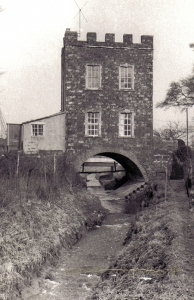 This castellated structure, also known as the Gate House, was built across the brook and some have suggested that it housed the man responsible for controlling the flow of water by means of sluice gates, which have long since disappeared. 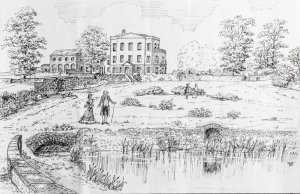 These would have allowed the full flow of Siston brook to flow into the lake or to be directed along the leet into Echo Pond – from where it ran through a culvert and thence to the centre of the works. Free car parking is available when you visit the garden. Built by William Champion in the mid 18th century, this Palladian style house is now a residential and nursing home. William entertained many famous contemporaries here including Joseph Banks, the botanist, and John Wesley, founder of the Methodist movement. The house was occupied in the early 20th century by the Haskins family, the most famous of whom is Minnie Haskins. She wrote the verse quoted by HM King George VI in his Christmas broadcast of 1939 which started, “I said to the man at the gate of the year. . . ” During the Festival of Britain in 1951, Minnie was invited back to Warmley House – by then being used by Warmley Rural District Council – to unveil a plaque by the door commemorating her much loved poem. This verse was also used at the funeral of HM Queen Elizabeth, The Queen Mother. William Champion created one of the earliest pin factories in the country. Besides supplying brass wire to other pin manufacturers, he made pins here by the million. The process involved cutting the wire to a length for the shank and also to make the head. Twisting wire into a long coil made the head; each three turns of the coil were then cut and separated to produce a myriad of pinheads. The end of each shank was used to pick up one head that was put onto a block in the pinmaking machine. A foot pedal was used to compress the head onto the shank of the pin operated the processing mechanism. The final stages in manufacture included cleaning and sharpening the newly manufactured pin. Pins were used in dressmaking and also lace making. Up until the early 1900s they were used as change in haberdashers shops when the amount to be paid was nineteen and eleven pence halfpenny, the packet of pins being worth one halfpenny.